Varisi Healthy Nails dress and clean nails that have adversely affected by artificial products and traumatization. Use successfully on fingernails, toe nails and all artificial fiberglass, wraps, gels & polish. Performance Guaranteed Or Your Money Back! 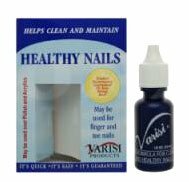 For those who have acrylic, gel, linen, silk, or fiberglass nail products already applied, there's no need to give up the fashionable look you enjoy to achieve the desired cleansing effects of Varisi. It may be used with all artificial products, for clean healthy nails.